I was lucky to have the day off from my internship on Saturday since that meant I got to spend time with my parents who were in town for the weekend! Since I knew they were coming, and that they would probably need to eat at some point, I made reservation for Saturday brunch at Greens Restaurant in the Marina neighborhood of San Francisco. Greens Restaurant was recommended to me by multiple people as the go-to restaurant for veg-friendly fare in San Francisco (second to Millennium of course!). They pride themselves in having a local and completely vegetarian menu, I was happy to see that they had a few vegan options as well. When we first entered the restaurant I was struck by how big and airy the space felt. 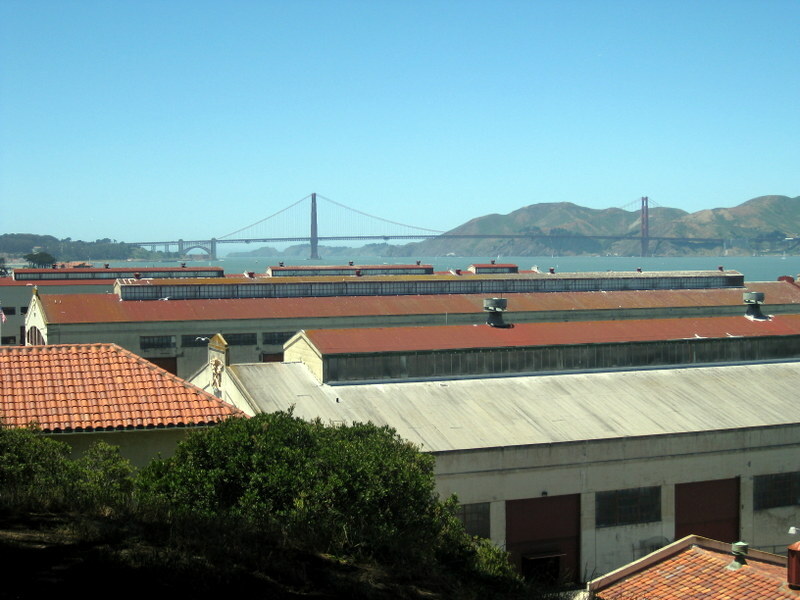 It used to be a military warehouse that was converted into a restaurant in 1979. 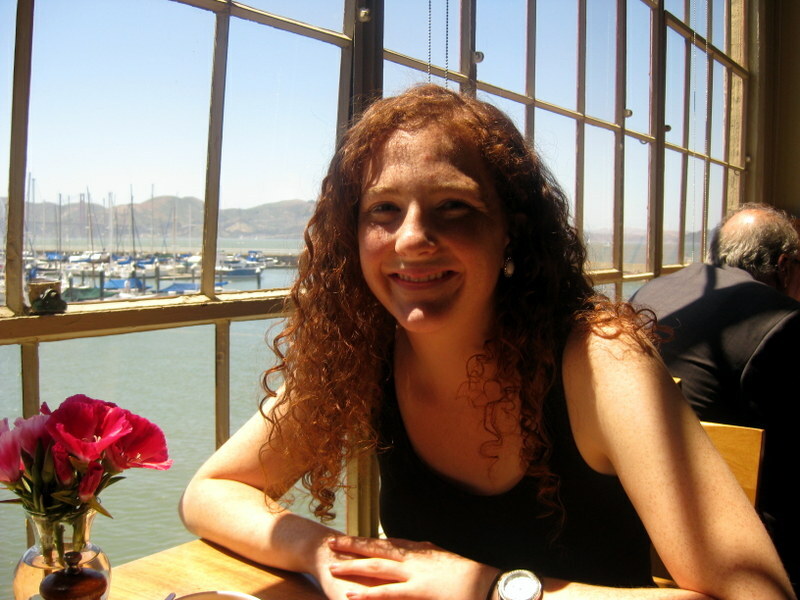 We were seated at a table next to a huge window with a great view of the Golden Gate Bridge. 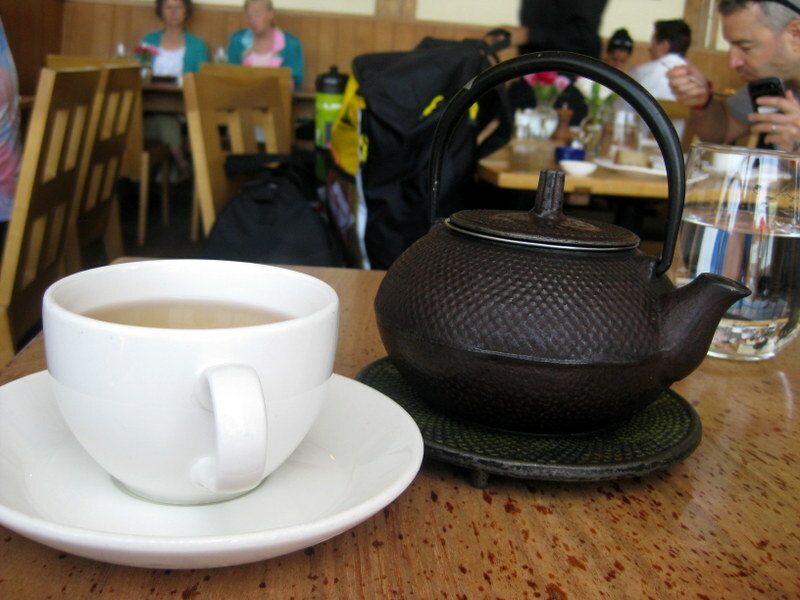 I ordered Jasmine Green Tea, which came in a precious teapot. My first cup was really great but after that it got way too strong, I should have removed the leaves! 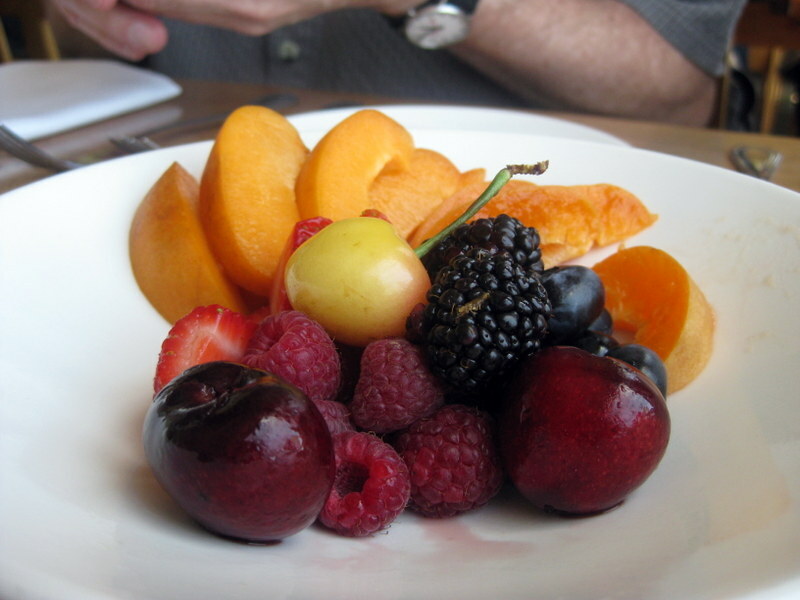 We started with fresh, seasonal mixed fruit. 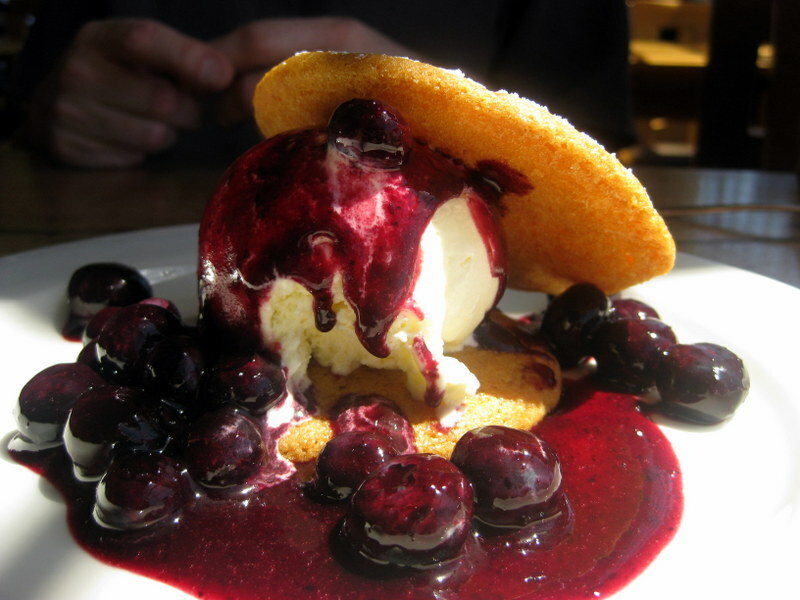 The blueberries and cherries right now in California are divine. Check out that yellow cherry! 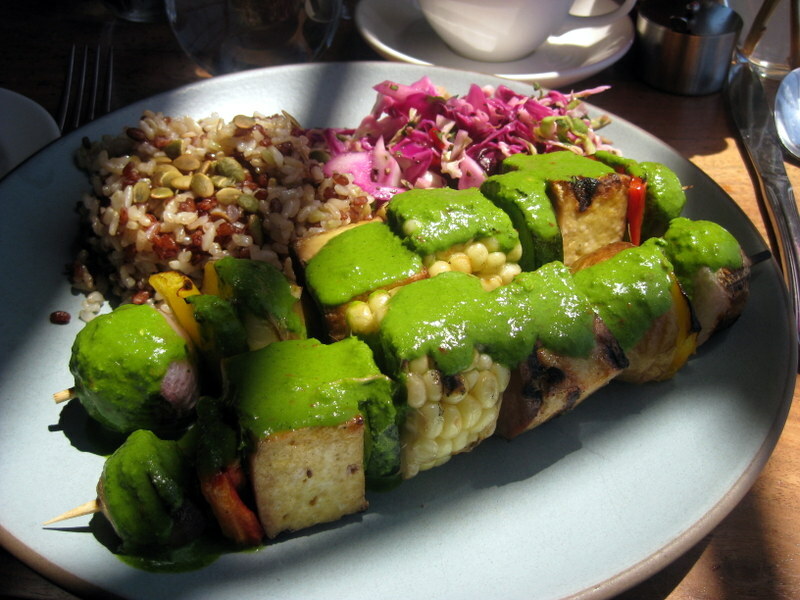 For my entrée I ordered Mesquite Grilled Brochettes, which were skewers of tofu, mushrooms, red peppers, corn, onion, zucchini and squash served with a zesty cilantro sauce. On the side was a mélange of rice with toasted pumpkin seeds and some slaw. Mm, I would definitely order this again! I especially liked the sauce and the skewers made the dish more fun to eat. I thought that the tofu cubes were a little on the large side though, it would have been nice if they were half the size. My mom ordered Yellow Finn Potato Griddle Cakes with manchego cheese and chives. 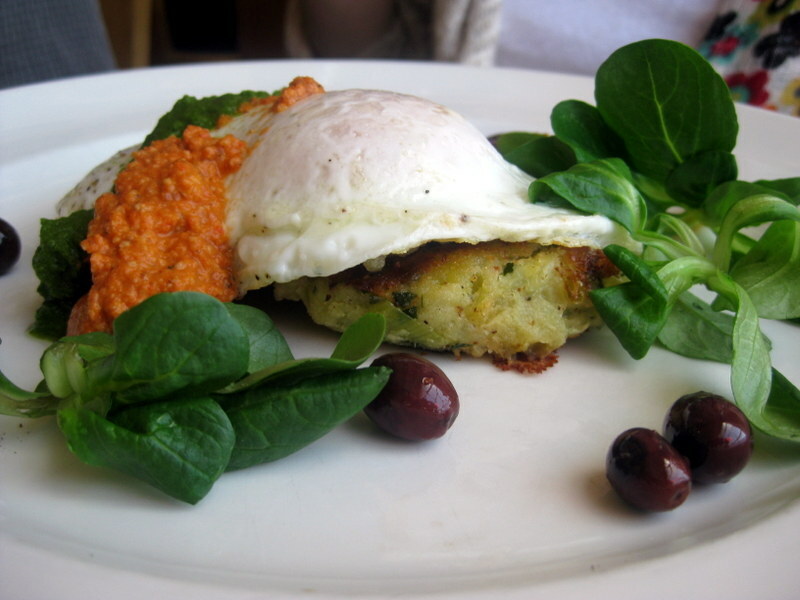 Served with eggs over easy, romesco sauce, salsa verde, olives and side salad. My mom said that the egg was very fresh and cooked to perfection. 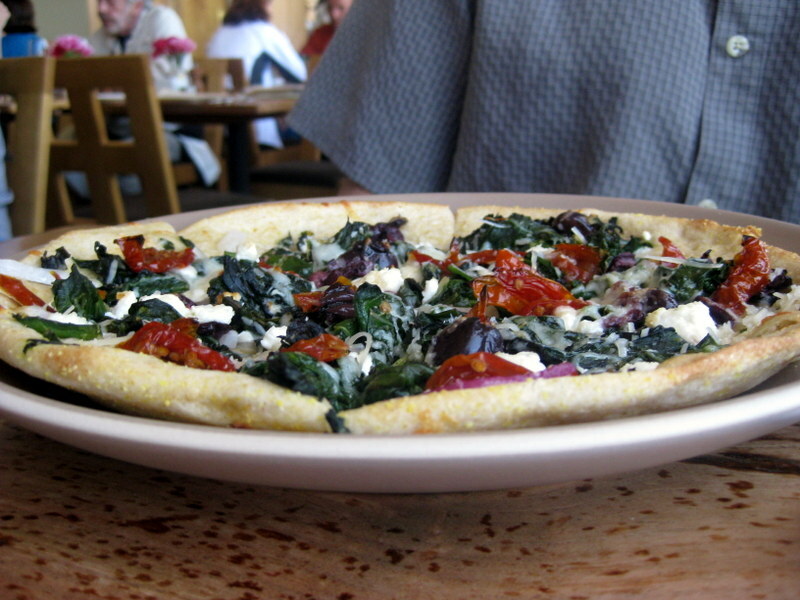 My dad had the Greek Pizza, which was topped with spinach, feta cheese, olives, shallots and roasted tomatoes (I think, I can’t really remember and it’s not on the menu online…). It looked great and got two thumbs up from Papa Dearest. The best part of the meal, in my opinion, was dessert! I got a trio of sorbet with a vegan shortbread cookie. The cookie was so good, I really want to know how they made it since shortbread typically has 1000 pounds of butter in it! 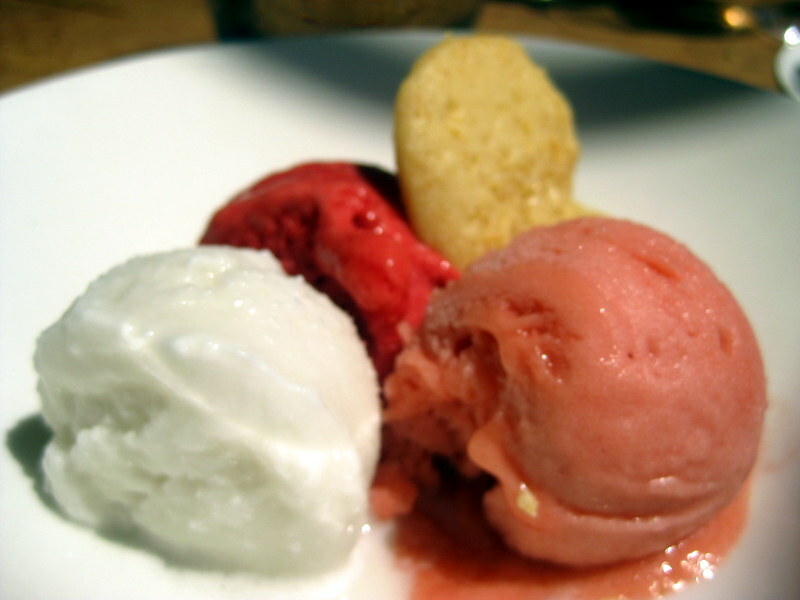 The sorbets were rhubarb, strawberry and coconut. Rhubarb was the winner in my book, but coconut came a close second. I was sad when my dessert was over, I couldn’t get enough! Overall, I loved Greens and I would definitely go back! Today I made a batch of soup for lunch. 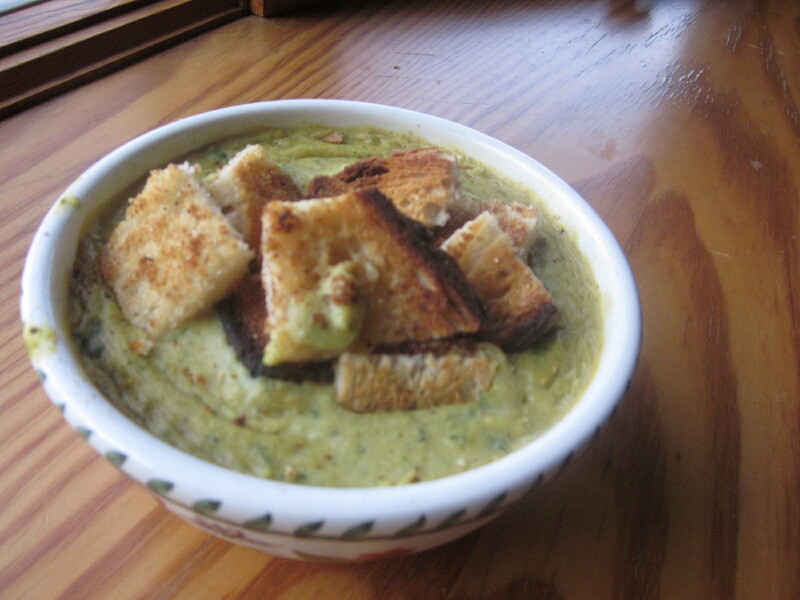 I bookmarked a recipe from Angela at Oh She Glows a couple of weeks ago for Broccoli and Cheeze Soup. Whenever I go to Au Bon Pain I always like the look of their Broccoli Cheddar soup, but alas, it is not Fiona’s diet-friendly. So I was super excited when I saw this recipe, and for good reason, it is DELICIOUS! I’ve been impressed with every OSG recipe I’ve tried and this was no exception. I made my own croutons to go on top as well! I toasted some bread, slathered it with Earth Balance and garlic powder and then toasted it again. This made 4 HUGE servings of filling soup and was the perfect lunch. My only advice is, if you don’t like things spicy, scale back the cayenne pepper!